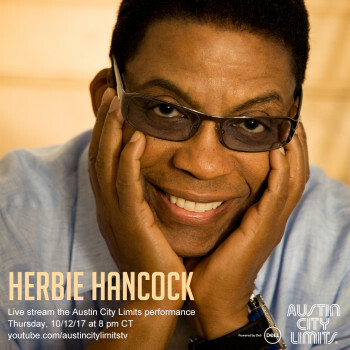 Austin City Limits is thrilled to announce that we will be streaming the debut taping of one of the most celebrated musicians in the world—legendary jazz composer and keyboardist Herbie Hancock on Thursday, October 12 directly from the ACL stage at 8pm CT/9 pm ET on ACLTV’s YouTube channel. 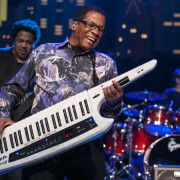 Herbie Hancock makes his Austin City Limits debut performing works from throughout his extraordinary career. Now in the fifth decade of his professional life, the Chicago native remains at the forefront of world culture, technology, business and music. Hancock has been an integral part of every popular music movement since the 1960s. He was a member of the Miles Davis Quintet that pioneered a groundbreaking sound in jazz, and in the 70s he developed new approaches heard in record-breaking albums like Headhunters, combining electric jazz with funk and rock. His trailblazing 1983 crossover smash “Rockit,” an early hip-hop touchstone, is considered one of the first songs to feature scratching, with Future Shock – the album from which it comes – marking Hancock’s foray into electronic dance sounds. During the same period he also continued to work in an acoustic setting with V.S.O.P., which included his ex-Miles Davis bandmates Wayne Shorter, Ron Carter, and Tony Williams. Hancock received an Academy Award for his Round Midnight film score and fourteen Grammy Awards, including Album Of The Year for River: The Joni Letters — only the second jazz album in the Recording Academy’s history to ever receive that award — and two Grammy Awards for 2011’s globally collaborative CD The Imagine Project. He was awarded a Kennedy Center Honor in 2013, published his memoir Herbie Hancock: Possibilities in 2014 and received a Grammy Lifetime Achievement Award in 2016. Many of his compositions, including “Cantaloupe Island,” “Maiden Voyage,” “Watermelon Man” (a tune from his first album that has been recorded over 200 times) and “Chameleon” are modern standards. Hancock will be joined by his stellar live band, including bassist James Genus (Lee Konitz, Dave Douglas), drummer Vinnie Colaiuta (Frank Zappa, Sting) and multi-instrumentalist Terrace Martin (Kendrick Lamar, Robert Glasper). Please join us October 12 for this full-set livestream on our ACLTV YouTube channel. The broadcast version will air on PBS early next year as part of our Season 43.